Sunglass Emporium Brands – Sunglasses are a necessity to protect eyes against harmful UV rays. Our business is based on that very important concept. We meet that challenge by selecting the highest quality brands possible. 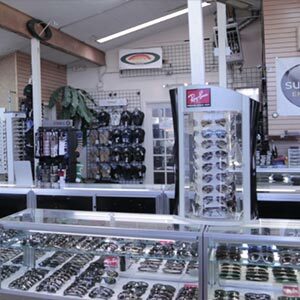 Whether you are cycling, horseback riding, motorcycling, skiing, boating, playing baseball, driving or just spending a leisurely day outdoors, Sunglass Emporium can accommodate almost any sunglass need. Our knowledgeable staff will guide you through the process of obtaining the correct frame, shape and color, size, as well as making the correct lens color choice. We are excited to have expanded our services to include prescription eyewear (refer to the prescription eyewear section). We also offer sunglass frames that fit over Rx glasses, as well as a variety of clip-ons for prescription eyewear. In addition to sunglasses, come in and check out our fun selection of hats, Stance socks, watches, and sun accessories. Below are many of the brands we offer.